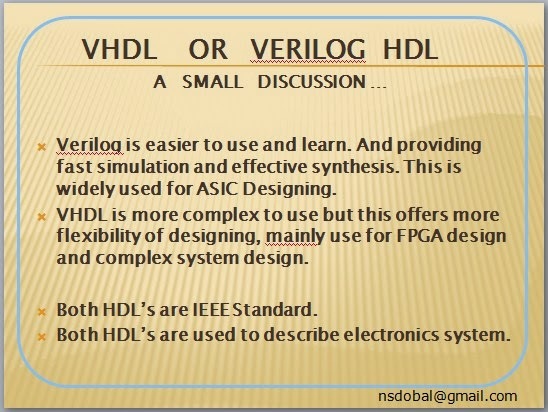 VHDL or Verilog HDL - A small discussion (Verilog HDL with Naresh Singh Dobal learning Series). Verilog RTL coding Synthesis You can also refer to the video https://youtu.be/uUZceAfnVNk for a great understanding of #verilog. This tutorial covers registers, unwanted latches & operator synthesis and helps you master these fundamental concepts.Check out the series of free tutorials by Mr. P R Sivakumar(CEO, Maven Silicon) on basic and advanced concepts of Front End VLSI. His amazing explanations and easy to understand content make these videos a great tool for you to update and upgrade your VLSI skills.